A classic whiskey decanter with a contemporary spin. The glass is mouth-blown, lead-free, weighty and exquisitely chic. Elegant for whiskey, spirits, cordials too. A classic whiskey decanter with a contemporary spin. The glass is mouth-blown, lead-free, weighty and exquisitely chic. Elegant for whiskey, spirits, cordials too. Dishwasher safe. Dimensions: 10 1/4"H, 25 1/3" oz. Do you despatch to the uk? BEST ANSWER: Yes we can ship to the UK. We have a second party company that handles our exports. Please place your order on our website and when you get to checkout you will see a tab for international shipping and they will provide the total charges with tax and duties.Thank you for shopping with us ! BEST ANSWER: My bourbon doesn't stay in the decantur long enough for me to notice issues with sealing (evaporation), and I don't lay it on it's side or hold it upside down so I don't understand why anyone would even comment on it. I have heard of no sealing issues with the Lexington Whiskey Decanter. Can this item have a monogram put on it? BEST ANSWER: We only personalize large quantity orders of this decanter. You can take it to an engraver and have them personalize it if you want. You can take it to be engraved. What are the height, width, depth dimensions? BEST ANSWER: The dimensions on this decanter are: 10 1/4“H x 4" W. It weighs 5 pounds and holds 25 1/3” oz. BEST ANSWER: I would look at the whiskey wedge glass item 776 42 01. You would need to purchase 4 of these as they are sold individually. Does this decanter contain lead? BEST ANSWER: The decanter is lead free. I would love to have this product engraved or personalized. The Ambassador Decanter is the only one that you have to be personalized but I like the shape of this decanter so much more. Is personalization possible for this product? Does this decanter only hold 25 oz? 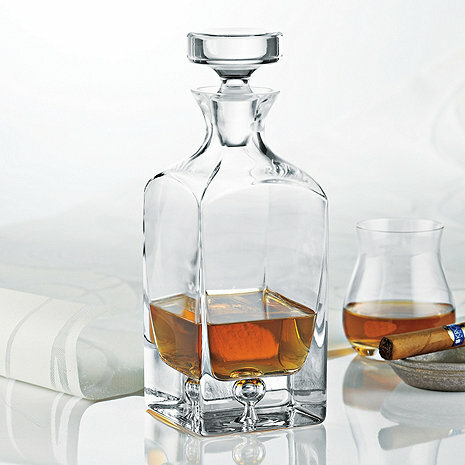 BEST ANSWER: Thank you for your question, yes the Lexington Decanter will hold up to 25 1/3 oz. total. We also carry the Madison Ave Decanter item # 76209 on our website, which can hold up to 32 oz. I bought this decanter for my own personal collection of whiskey. It over delivered. It has the presence needed in my personal bar as well as the weight and sheer masculinity I desired for my bar. Moreover, the price point is fantastic for the value received to date. For those who understand whiskey decanting, the glass plug does not at all impact the whiskey. This product is stylish, masculine, and fits in any whiskey drinkers bar. Best looking decanter you can find! I searched high and low for a masculine, sleek, classic but modern decanter and this is it! Many decanters have a feminine line to them and that is not what I wanted to give my husband for his Birthday to hold his whiskey. This decanter has that masculine weight to it but still holds a sleek curved look. From the stopper to the base that encloses a bubble, it says "I am the classic decanter for the modern man." The only con was that I couldn't get it etched with his monogram. But since I'm crafty, I took care of that myself! It's oddly difficult to find a classic, plain, lead-free decanter these days. We didn't want anything with a lot of designs cut into it, we just wanted something with clean lines, and a good top that seals to prevent evaporation. We wanted it for long-term display/storage, so leaded crystal was not an option. So far, this decanter looks and works great. While they look interesting I'm happy I went with this. The build quality is excellent and the timeless design means it will never date and I'll won't have to spend the weekend researching whiskey decanters again. Two thumbs up! This is a beautiful, sturdy and classic decanter that will look great on any bar. We have three -- all different styles -- and this one is our new favorite. Only down side was it was a pre-order right before Christmas, but it arrive as quickly as promised! I use this in my home bar and love it. I purchased the Lexington Whiskey Decanter for my husbands birthday in April. It was the closest match to the whiskey glasses I bought him. Like him, an aviation engineer & not into “frilly”, it is a solid, elegant, simple design with a weighted glass stopper and easy grip. It certainly didn’t hurt that it was on sale when I purchased the glasses! I bought this as a gift for my father. He was thrilled by it and immediately put his favorite liquor in it to display. This is a beautiful whisky decanter. I bought it as a gift for a friend and was disappointed that it didn't arrive in time for the occasion; however, it was nice enough that I just gave it as a late gift. It was worth the wait. Great quality and beautiful bubble style at bottom. giving it as a gift to a friend who is a whiskey lover. I bought the decanter for my husband as a gift. He loves it. It's a nice display in our home bar. The glass sparkles and adds a stylish accent to the room. This decanter goes well on our shelf with some of the other F and W decanters... Our collection is growing..
Use it for our home bar, which is not large but contains everything we and our friends like. The design actually matches exactly the barware we purchased when married 36 years ago. Coulnd't believe it matches so well and looks so good! The product was on back order, but we were not informed of this. A month after our purchase I had to call because it had not been shipped, so then they tell me it was on back order. Two months after the purchase, we finally received the product. I bought this as a retirement gift. My husband designed a whiskey box for this and 4 glasses. It turned out amazing. The modern style with the beautiful walnut and curly maple wood was stunning. Couldn't be happier. Delivery and service very good. This looks nice and feels nice but the top does not sit well in the neck and definitely does seal. After one or two days in this decanter our whiskey had some evaporation and was too strong to drink. It was as if we had just left the top off altogether.